The Marlow-Hunter 31, which has a length of 32’4” and a beam of 11’10”, will be a tough contender for any model in her size range that tries to compete with the volume below. One of her best features is the spacious cockpit that will deliver a feel more like that of a larger boat. Performance is a strong suit with a large sail plan and Glenn Henderson hull design with a hard chine below the waterline. Below, her quality fit and finish include real teak furniture and floors, Corian countertops, ball bearing drawer hardware and name brand appliances and equipment. The construction of the hull and deck utilizes Vinylester resins and gel-coats, continuous reinforcement fibers, Kevlar and state of the art Nida-coring for structural integrity. In addition to a keelboat version, a lifting keel and twin-rudder version is also offered. The inside has just been rethought entirely. Many storage areas and a very spacious aft cabin are part of this new layout stemming from the latest generation of Oceanis. The Marlow-Hunter 33 is a dreamboat for sailors shopping in the 30-34 foot range. 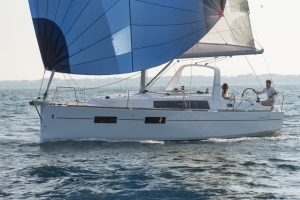 Quick and agile under sail, the main dominated fractional rig is easily tamed with extra leverage from the cockpit arch sheeting system, so the 33 is always easy for single-handers to manage. The cockpit design has been called “ideal” by many owners, referring to the space, layout, and placement of controls. Stern rail seats are free of rigging obstructions and securely fixed to the arch for a safe and comfortable view within arms reach of the wheel, traveler and jib sheets. A hinging helm seat allows effortless access to the swim platform for simple stern boarding from the dock or dinghy. The interior is roomy, bright and beautiful with a rich “cherry” interior and open floorplan allowed by placement of the mast compression post forward of the main bulkhead. 6’2” headroom, abundant storage space and a compact nav station round out the salon. Sleeping accommodations are spacious and simple with plenty of light and ventilation from the large opening hatches. Cruising World’s 2015 Boat of the Year is a unique design. 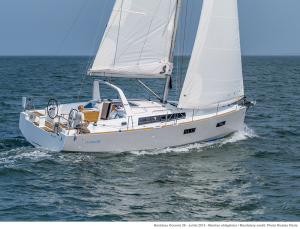 Beneteau introduces the second new model in its new versatile line of mid-size sailing yachts that can be built to spec anywhere from a simple Daysailer to a fully loaded Cruiser! 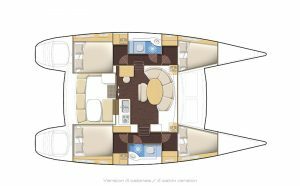 This innovative new 35 footer is offered in five interior layout configurations from an open plan up through a three cabin layout. Single head or optional separate stall shower. The removable forward bulkhead opens up the cabin, making it even roomier. The Marlow-Hunter 37 is a stunning cruiser and the largest volume sailboat on the market under 40 feet. The design has been improved upon with a hard hull chine featuring a wider beam carried further aft which allows for more space below as well as stability and performance on the water. The deck features a sleek, modern profile with large side windows allowing for a brightly lit interior. Lengthening the cockpit has allowed the MH37 to have a cockpit that is roomier and the fold-down cockpit table enables the crew to take advantage of more cockpit space. The 37 also features a fold-down swim platform that extends the cockpit another four feet when folded down while the boat is docked or at anchor. 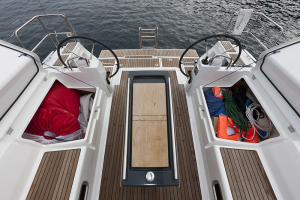 The master aft cabin is roomy and features comfortable headroom and private access to the head. The forward cabin is large enough that it has been mistaken for the master cabin. Meet the game changer! With her generous list of options, she introduced the sailing world to the concept that a yacht doesn’t have to be a 70′ one-off to fit her skipper’s needs. Cruising at everyone’s pace on seas the world over. 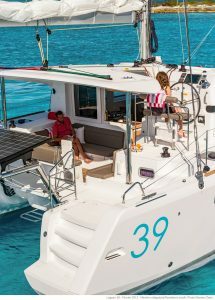 Sailing single-handed, as a couple, with the family or with friends, the Oceanis 38 can make all sailing dreams come true. Whether you are a day sailor or serious cruiser, the new Marlow-Hunter 40 is designed to please. Her superior sailing characteristics are honed from her 65 predecessors to emerge from our design center. Built in the United States, she is crafted by people who understand and respect the sea. Marlow-Hunter chose to launch the new MH40 on our fortieth anniversary with the desire to create a sailing vessel that exceeded the expectations of the past forty years. Experience the new MH40 with her dual helm control, fold-down transom, chined hull, and dual heads. The hand-crafted interiors are made to fit each boat. The result is an interior fit and finish that is as functional as it is beautiful. They say life begins at 40. Begin your sailing life with a Marlow-Hunter 40. With the Oceanis 41, the heart of the Oceanis range has a yacht of incomparable volume and a design with elegant, taut lines. Her new generation hull promises comfortable, fast sailing. The mainsail arch enables you to sail in complete safety and at the same time gives you more space in the cockpit. The continuous bilge over the full length of the boat creates excellent hull rigidity. With limited heel, the yacht’s seakeeping is improved without you losing speed. On board the Oceanis 45, harmony reigns supreme: everything is in its place on this beautiful yacht, which can aspire to meet four profile of life aboard. This can be recognized in a great number of thoughtful details: a chart table that is also a living room table, a bilge increasing overall comfort, an open bathing platform making access to the sea easier. With its four layouts, it is a yacht that adapts to all requirements: from going around the world with 2 or 3 cabins to accommodating large families with four double cabins. Undisputed world champion in its sales category, the 380 is popular for a good reason. 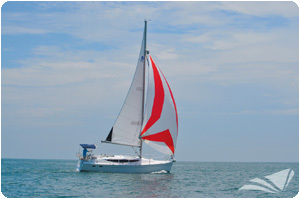 It’s fast under sail, easy and safe to maneuver, and is the roomiest 38′ boat you’ve ever seen. 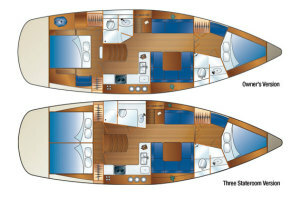 The Lagoon 380 offers a simple, efficient deck layout and the option between 3 or 4 cabin designs. The 39 is a new addition to the Lagoon lineup, and you’ll notice the family resemblance right away. The 39 separates itself with some innovative attributes. For example, the possibility to have a 2 luxurious cabin owner’s version, with a king size bed, a desk, a sofa, a large hanging locker, and a wide bathroom forward in each hull. Or go with the 3 or 4 cabin versions. The cabins have incomparable natural lighting thanks to the fixed hull windows, together with excellent ventilation thanks to the deck hatches and portholes that open out to the hull-side. Lagoon even moved the mast aft for more ease of sail handling. 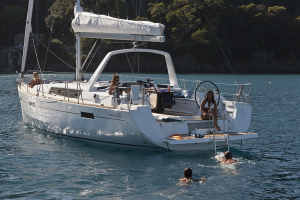 The Lagoon 400 is the prototypical cruising catamaran. It can comfortably accommodate 8 people with 4 cabins and 4 private heads. The trampoline is large enough for 4 people to take an afternoon siesta, and the running rigging is set up to make it easy to sail shorthanded. This new member of the Lagoon family has style and a strong personality. While keeping a family resemblance and retaining the main features of the latest generation of Lagoons, it shows us a new path: unhurried evolution, a new “organic” approach, in search of harmony between living space and man. An elegant silhouette, flowing curves which, by virtue of a noticeable acceleration of the lines in both the bows and new coachroof design, emphasizing the powerful and dynamic nature of this new model… A VPLP design naturally, a guarantee of performance under sail!